The early October morning was dark and cold. The family had driven from the trailer park near the rail yards in the fair size central south-side Virginia town that hosted the trailer park. The 30 year old infantry captain drove the two door Pontiac to the nearby army post that the captain’s unit was stationed at. The captain’s wife rode in the right front seat while two small boys sat in the back seat one not quite three and the other four years old. The captain drove carefully in the dark to the post then to the loading area where troops of the combat infantry division he was assigned to were loading buses. Other families were moving with their soldier husbands and fathers to the same area. The car trunk was loaded with the captain’s duffle bag and carrying bag. Other clothing, equipment and necessary items had been packed in footlockers and loaded separately. On that cold Virginia October morning, the men and officers of an infantry division that had been coming to full establishment, training extensively at the army posts it was assigned to and another installation further north, and participating in a large maneuver exercise in the Central Atlantic Coastal Area was now finally deploying overseas. The Korean War was at the end of its first year and the Truman Administration, concerned about indications of Soviet Bloc intrusion further into Europe, determined to reinforce NATO Forces in Europe with two infantry divisions. The captain parked near other cars that had arrived or were arriving at the same location. Nearby was a long line of chartered buses. Soldiers and officers were loading gear into the storage bays under the busses. Oddly, despite the numbers of soldiers and families, all of the activity seemed ordered and with a purpose, proceeding rapidly toward an objective. There was a lot of activity but it seemed muted in the darkness. Bus and car headlights did illuminate but the darkness seemed to dominate. Officers and men with families present said their good byes as they loaded the busses. Soon the busses in a long single column moved on the road through post and the adjacent town to U. S. 360 heading east to Norfolk. The families watched what they could of the busses and when there was no sound the wives gathered up their children and started driving back to places they had been residing, soon to leave themselves. It was still dark. These families would not be together again with their soldier fathers and husbands until the beginning of the following February. The captain’s wife drove back to the trailer. The trailer had been packed and prepared for towing by the captain and his wife before his departure. 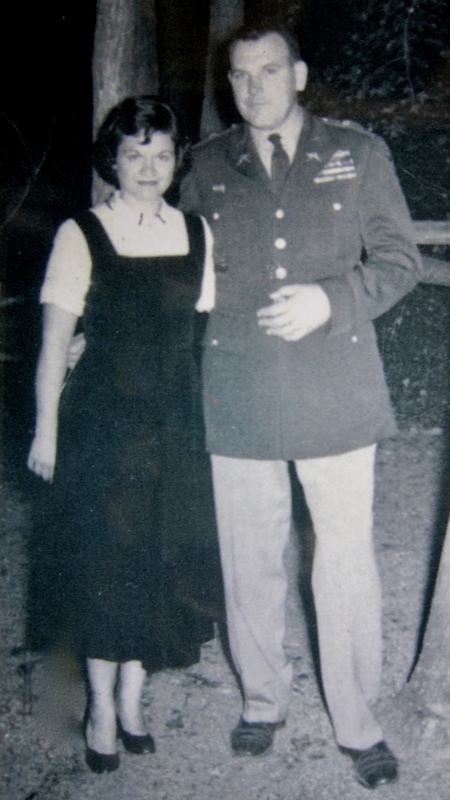 Later that morning, the wife’s brother, a mobilized Air National Guard senior NCO stationed at an air base in New York who had taken leave, arrived to drive the car and trailer back to Connecticut. On the U. S. Highways of the times the ride to Connecticut hauling a trailer was a good 17 hour drive. The sergeant drove through the day and night. The captain’s wife sold the trailer and moved into a rented apartment in Hartford. She had family, a large Quebecois family, in the area which helped—all of the men of the family were veterans of the recent war or were back in service because of Korea. There was a sense of lending a hand. The captain’s wife had planning and preparation to do for the anticipated move early in the new year. There was some doubt about quarters availability in Germany but preparations went ahead. Inoculations, shipping additional household goods, shipping the family car, and making a Thanksgiving and Christmas without Dad happen for two small boys proved a busy and challenging schedule. The Christmas without Dad went well enough for the little family. But it was tough. The unique feelings an Army family experiences at Christmas with a soldier parent deployed cannot be put into words—everything focuses on when the parent will return. Soon enough, the captain’s wife had completed the packing and shipping and other preparations. The family loaded their luggage into the family car and her brother’s car and drove to the military terminal in Bayonne, New Jersey. There the car was loaded for shipping. The family then loaded busses for the ride to the military terminal in New York City where brother and other accompanying family met them at the terminal to wish a bon voyage. On arrival at the terminal the family began the boarding process for the troopship USNS General Maurice Rose. It was early February 1952 and cold. The 26 year old mother of two bid farewell to family from the ship’s rail as it pulled away from the dock. Soon the transport was in the ship channel passing the Statue of Liberty. She and her two small boys would not return to the United States until October 1954. Her youngest, a very active and mobile three year old, was testing the boundaries. The ship rails were not a good place to be. She returned to her cabin. The cabins were comfortable for the times though certainly not to the standard of a commercial liner of the day. The food was excellent and there was a movie theater on the ship. But it was February and the ship was on a course eastward in the North Atlantic. It would not reach Bremerhaven for over a week. Within a day as the ship gained open water, the sky became overcast and the sea turned gray. The swells increased. Three days out the ship encountered a storm that it endured for several days. The 608 foot ship was rolling dramatically and as it crashed into the growing swells, the massive steel structure shuddered. Though the cabins were upper deck, any opening of a gangway door to the rail deck was greeted by sea water crashing in. It was like riding a huge steel “bucking bronco.” Everyone got motion sick. The young mother turned the experience into an adventure for her two boys. As they gained their sea legs she kept spirits up with her attitude and made the experience as much of a game as she could—even singing a song or two of old Quebec. It paid off. Both boys got over the motion sickness and for the last five days of the voyage enjoyed the ride—and the food. The steward’s early morning “rise and shine with chimes” pleasantly started the day for two little boys. The weather and sea remained gray even after sailing out of the storm but watching the ships wake was mesmerizing. The last days passed and the ship entered Bremerhaven port. The young mother and her boys along with other passengers disembarked. An efficient de-boarding process segregated the passengers into groups by their destination commands, they were loaded onto the olive drab “White Truck Co.” manufactured flat sided army busses of the day (these buses, shoe boxes on wheels, and built like tanks, were designed to convert to ambulances if needed) for transfer to the Bahnhof and the German train that would move them to the command they were part of. The little family boarded the train with their transferred luggage and began a journey through the night from Bremerhaven to Munich. All through the night the boys watched the German country side pass by, an occasional train flashing past in the opposite direction on parallel tracks, and the fascinating lighted stations and activity flashing by as well, strange and new. The train pulled into the Bahnhof in Munich late the next morning. The captain was waiting for his family on the station platform. After over three months of separation, the embraces of husband and wife and father and children were long and tight. The family loaded into the vehicle the captain had been able to arrange for transit to the family’s new quarters. The family took up residence in newly constructed apartment type quarters on the third floor. The captain had a surprise waiting—the windows of the quarters had been painted with a Christmas theme of the baby Jesus, Mary and Joseph and angels in gold tempera paint—and the family celebrated “their family” Christmas, with presents in the German style. That Christmas is remembered to this day. 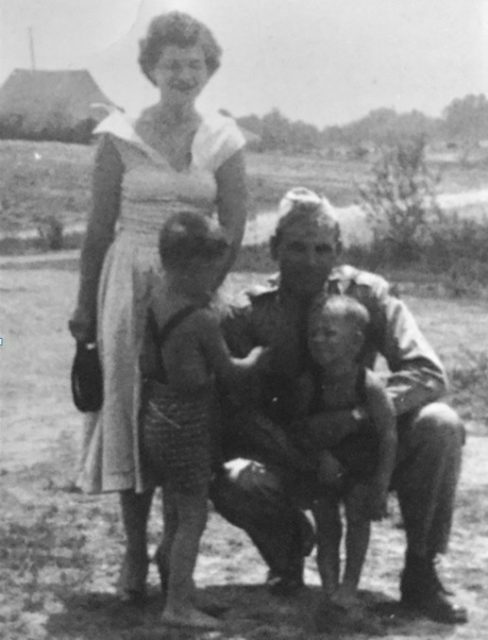 Through the three months of separation with all of the logistics along with caring for two young boys, the captain’s wife had demonstrated her leadership ability in this first foray into the world of the military wife. She had worked with other wives in the same situation in a distaff role lending support and assistance. She had operated successfully and independently for these three months. By her example her two little boys had a good experience that set the tone for the future. The leadership abilities demonstrated by the captain’s wife would be further applied throughout the tour in Germany, the captain being almost continuously in the field. Her abilities would meet further challenges when the family relocated north to Fuerth, West Germany, initially living on the German economy before quarters became available. Other leadership tests were on the horizon when the tour in Germany ended with reassignment to Ft. Knox, Kentucky and her husband’s later deployment for a year to Viet Nam. In the coming years there would be other troop unit heavy field deployment schedules and temporary duty deployments of up to three months at distant installations or schools as well as a return to Germany and another combat infantry division on Freedom’s Frontier. The captain’s wife and her leadership would rise to the occasion every time. 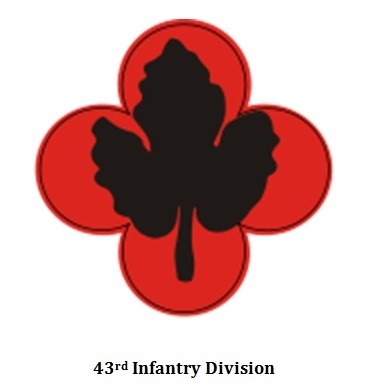 NOTE: The patch shown, that of the 43rd Infantry Division, represents the New England states of Connecticut, Maine, Rhode Island and Vermont with each of the four red circles that join to form the red quatrefoil. National Guard units from these four states were the original units of the division when formed in 1921. Some of these units had been organized into the other National Guard division then organized in New England, the 26th, during WWI. The black grape leaf refers to the New England wild grape and its reference by the Vikings to Vineland. The division was an active combat division of the Army of the United States from February 1941to late 1945 after occupation duty in Japan. Units of the division made as many as five combat amphibious assaults in the Pacific War–in the Solomons, New Georgia, New Guinea, Luzon, PI. The division again served as an active combat division of the Army from October 1950 to about July 1954. Units of the division received U.S. Presidential and Philippine Presidential unit citations. When I read this article, I immediately thought of my dear mother who showed her remarkable family leadership during my father’s absences from Canada during both WW II and the Korean conflict. Left to manage a rambunctious tribe of five children (soon to be six after the Korean conflict), I am forever grateful for her loving care. Paul, great comment, that’s the purpose. To remember and celebrate that special leadership our mothers demonstrated. And their daughters and granddaughters are continuing to demonstrate it in the perhaps more challenging times we are in. Not only am I grateful, I likely would not have made it this far without that special leadership.